As a longtime member of what some people imagine to be a stuffy yacht club on the San Francisco cityfront, I am pleased to share a few thoughts regarding the skill sets of the racing sailor and the place of kiting in that community. The thoughts, that is, of fellow club member Johnny Heineken, second place skipper at the US Youth Sailing Championships of 2006, first place skipper at the 29er Nationals that year and at the same time a key member of UC Santa Barbara’s sailing team. 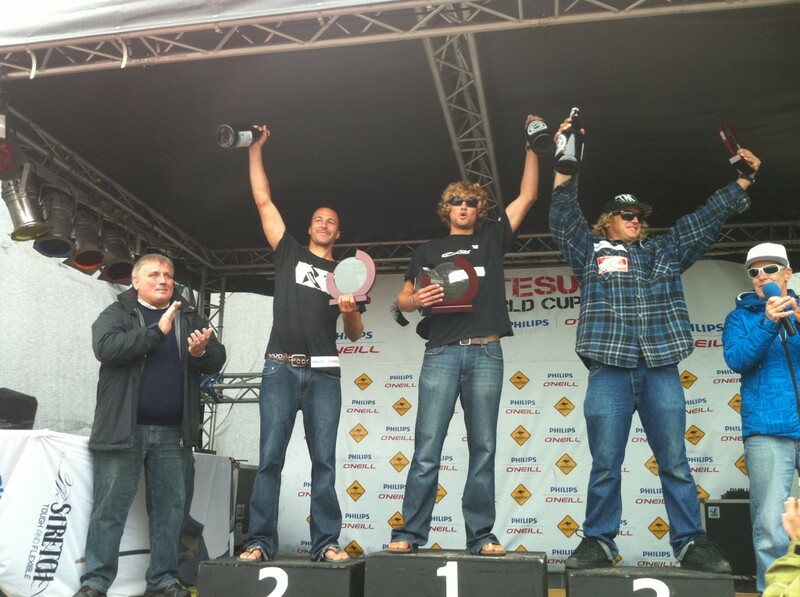 More recently, podium number one at the 2011 kite course-racing world championship. Number one, as in crushed the fleet. As in, fell all the way to second twice in twelve races, and that includes come-from-behinds in which he lost sight of marks in high winds and high waves and had to turn around and chase down people who had been lucky enough to blunder into the right patch of water. And the point is, he is (still) a sailor. At the peak, waves to three meters, according to the race committee. Six to eight feet, I heard from the sailors. What we know for sure, race committee work was an exercise in survival (thanks, guys), and photographers couldn’t get out, much less do their thing. There is no visual record of those races. The worlds wrapped last week in Sylt, Germany. Now it’s time to think this through. First off, I reckon my fellow yacht club member’s blue blazer was a mite crumpled from travel, and he was embarrassed to wear it on stage. No doubt, his club tie is somewhere in lost luggage, but it will turn up. We should note that Mr. Heineken had been going to school and later interning while a lot of his competitors were full-time kiting, so even he may have been surprised by so much success. And here is what I get from our UC Santa Barbara graduate and Team Ozone sailor. As they used to say in late-night TV, Heeere’s Johnny . . .
Two weeks ago a contingent of Bay Area kiters left SFO with our boats in our bags, headed for Europe. The crew included 2010 World Champion Adam Koch, his brother Andy, San Francisco Bay legend Chip Wasson, Bryan Lake, Joey Pasquali, and me. Coming from the Bay Area, we fancy ourselves big-breeze sailors, but Sylt took us to the next level plus. Over the six-day Kiteboard Course Racing World Championships, this tiny German island in the North Sea provided us with the gnarliest conditions I have ever experienced under sail. But the boys from San Francisco Bay held it together, taking first, second and third. In fact, six of the top thirteen sailors were people who regularly race in the Thursday night series at St. Francis Yacht Club, where kite course racing was invented. For us locals, it’s the equivalent of “beer can” racing, but, considering the evidence, it is just possible that these Thursday night races are as competitive as any international event, anytime, anywhere. All the Bay Area guys have boat-racing backgrounds. Yes, “the sail” is flying, and yes, “the boat” weighs 12 pounds, but really, this is just another form of high performance sailing (and I would argue, the most fun). Having good starts and calling good laylines is just as important as in a 29er or a Club 420. 1. We worked together on technique and designs, sharing everything, always pushing the performance envelope and improving as a group. Bay Area board designer Mike Zajicek shaped and built all our boards and worked with our feedback to refine and improve them. Fin and kite designers were actively, I should say fervidly, engaged. We had no coaching or group funding a la the French team. But as I said, we trained together and shared knowledge. The French were caught up in their own competitive bubble. We sailed past them as a group. 2. We trained hard and effectively. Living in trailers at Sherman Island and sailing 2-3 sessions per day on the river got us the sailing time we needed. I sometimes carry a GPS, and after one day of sailing a while back I had covered more than 75 miles, averaging 16 knots upwind and high 20’s downwind, with a top speed of 34 knots. That’s a lot of sailing. But we didn’t just grind on boat speed for hours on end. Short courses, mark roundings, tacking and gybing drills—that was the most valuable practice. Our comfort in maneuvers and around other kites allowed us to get our heads out of the boat and into the racing. 1. Kite course racing is ready for prime time. Visually, it is spectacular, featuring crossing speeds of 30 X 2 knots and very close competition among superb sailors and athletes. We even have our controversies, and if you’re a racing sailor, they might have a familiar ring. For example, our raceboard “box” rule is working well, producing boards a little over six feet long, and board development is moving too fast, in my opinion, for organizers to anoint a production class. Nevertheless, a production rule is scheduled to go into effect in 2012 (a minimum run of 50 boards) and everyone will have to be on a production board. Also, the rules allow us to register only three kites per event. This is well-intentioned, but it doesn’t change the number of kites that most competitors buy, or carry to an event. It just sends them out underpowered or overpowered because they had to guess too far ahead. It lowers the quality of competition, it can be a safety issue, and I guess we’ll be talking about it for a while. 2. San Francisco Bay has yet another claim on being the high performance center of the sailing world. J.H. The Draft EIR was issued by the Planning Department today. Interested persons may obtain the document at the Planning Department Public Information Counter at 1660 Mission Street, 1st floor, or go to: http://tinyurl.com/meacases. Oral public comments on the Draft EIR will be heard before the Planning Commission on August 11, 2011 where comments will be transcribed by a court reporter. Written comments will be accepted by the Planning Department until the close of the 45-day public review period on August 25, 2011. Written comments should be sent to Bill Wycko, San Francisco Planning Department, 1650 Mission Street, Suite 400, San Francisco, CA 94103, or sent by email to Joy Navarrete, the CEQA coordinator for this project, at joy.navarrete@sfgov.org. After the close of the comment period described above the Planning Department will prepare a Comments and Responses document that will respond to all oral and written comments received. It will be published in Fall 2011 and then brought before the Planning Commission for final certification as required prior to any project approvals.